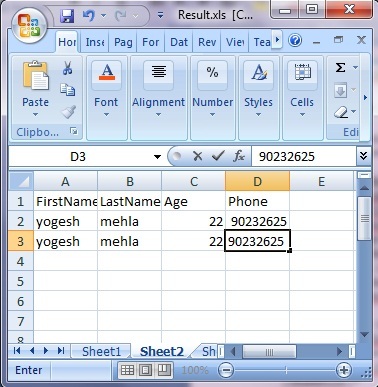 olecomm.CommandText = "Select FirstName, LastName, Age, Phone from [Sheet1$]"
"(FirstName, LastName, Age, Phone) values (@FName, @LName, @Age, @Phone)"
The System.Data.OleDb namespace is the.NET Framework Data Provider for OLE DB. The.NET Framework Data Provider for OLE DB describes a collection of classes used to access an OLE DB data source in the managed space. Using the OleDbDataAdapter, you can fill a memory-resident DataSet that you can use to query and update the data source.